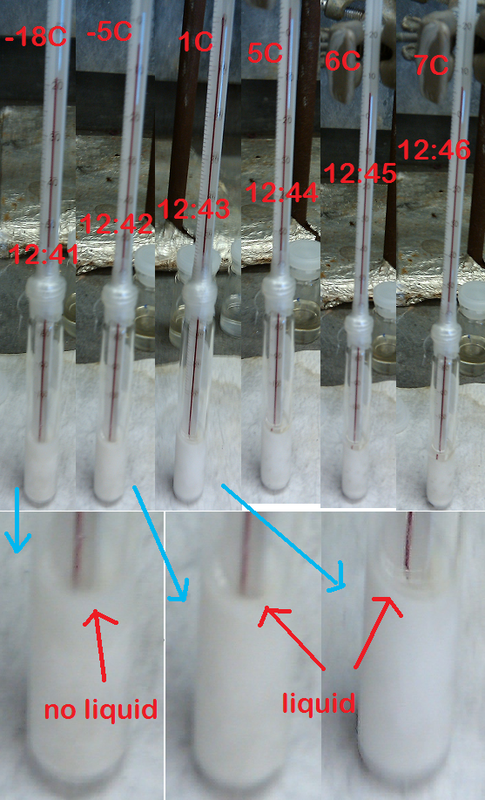 With the information available thus far from our experiments (UC-EXP266), we think it is unlikely that the +4.6 C value can be correct because we observed no solidification after 2 days at -15 C. The patent reports that solidification of some viscous mixtures took up to a full week but we did not observe an appreciable increase in viscosity for 4-benzyltoluene at -15 C. But in order to be sure we will first freeze the sample again below -40 C and let it warm up to -15 C in the freezer and confirm that it melts completely. 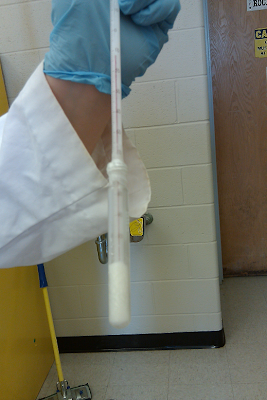 But when we took the sample out of the freezer after 16 days it was completely frozen! When I introduce the concept of Open Notebook Science in my talks I usually make the point that there are no facts - just measurements embedded within assumptions. 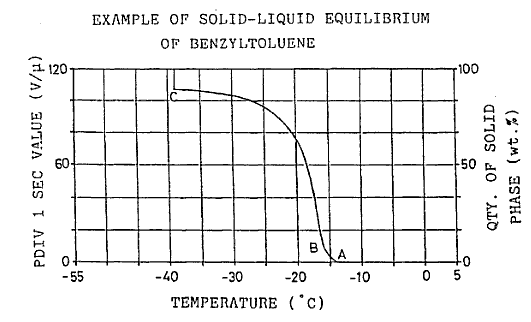 The 4-benzyltoluene melting point story is a really good example of this principle. 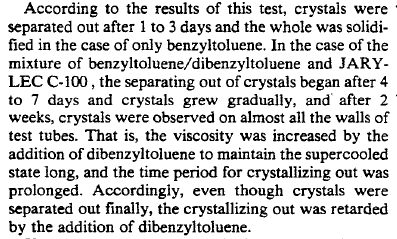 When I stated that I thought that "it is unlikely that the +4.6 C value can be correct because we observed no solidification after 2 days at -15 C", it was not the measurement that was in error - it was the interpretation. And when new information came to light, an experiment was proposed to either challenge or further support that interpretation. 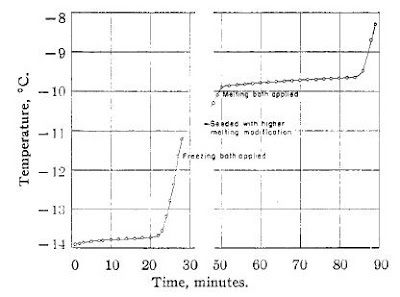 There were never any "facts" in this story (nor is the +4.6 C value a "fact" from these results). 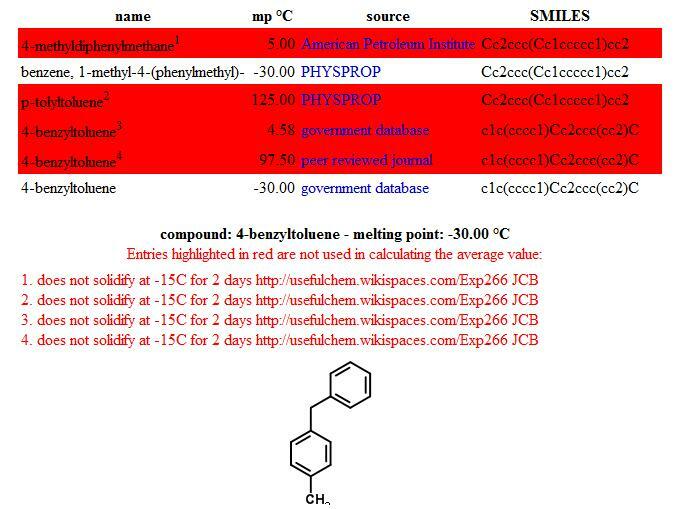 Rich Apodaca recently demonstrated how Google Apps Scripts can be added to Google Spreadsheets to enable simple calling of web services for chemistry applications (gChem). Although we have been using web service calls from within a Google spreadsheet for some time (solubility calculation by NMR link #3 and misc chem conversions link #1), the process wasn't as intuitive as it could be because one had to find then paste lengthy urls. Rich's approach enables simply clicking the desired web service from a menu on Google Spreadsheets and these functions have simple names like getSMILES. 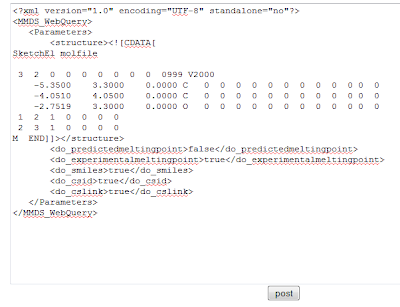 Andrew Lang has now added several web services from our ONS projects and the CDK. There are now 3 menus to choose from: gChem, gCDK and gONS. To demonstrate the power of these tools consider the rapid construction of a customized interface to an experiment in a lab notebook (in this example UC-EXP263). 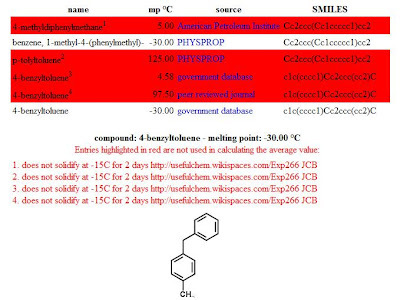 1) Because Andy has added a gONS service to render images of molecules from ChemSpider, consistent reaction schemes can now be constructed from this template by simply typing the name of the reactants and products then embedding in the wiki. 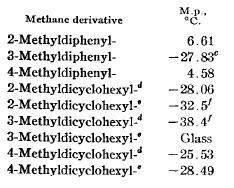 2) Planning of the reaction to calculate reactant amounts and product yield can then be processed by simply typing the name of the chemicals. 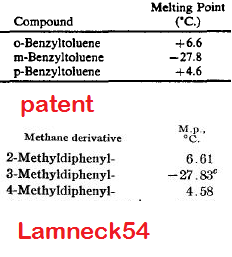 Services calling molecular weight and density are automatic based on the chemical name as input. 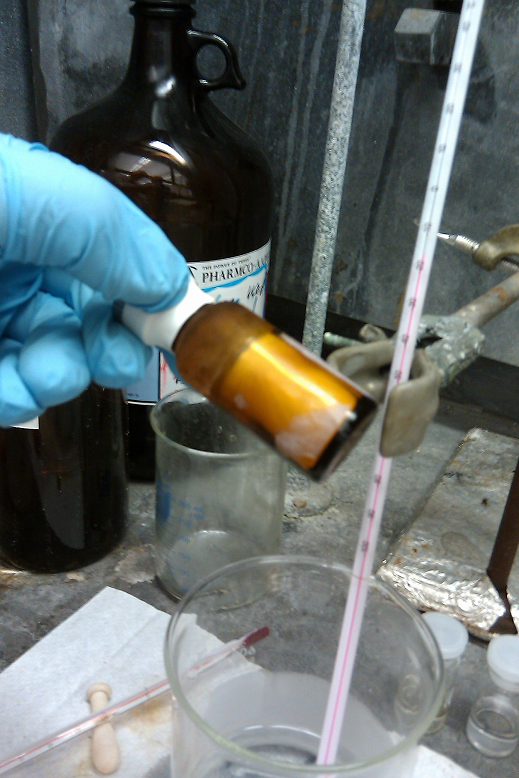 3) Typing the name of the solvent then allows easy access to the solubility properties of the reaction components. The calculated concentrations of the reactants and product can be directly compared with their measured maximum solubility. 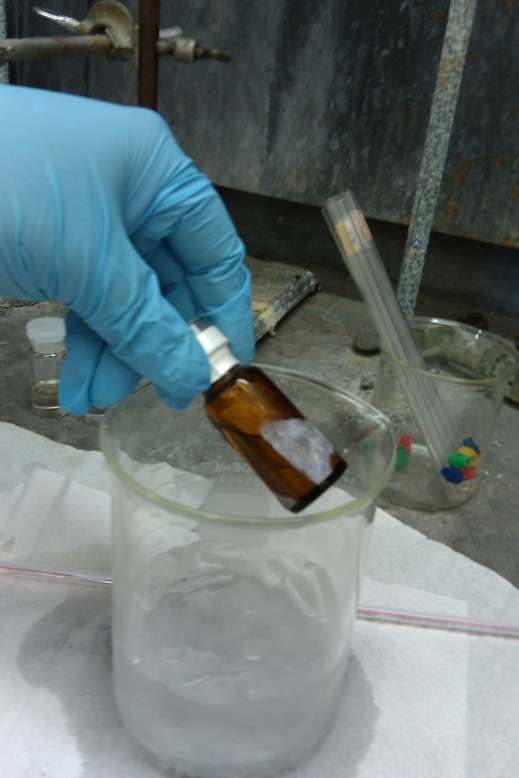 In this experiment the observed separation of the product from the solution is consistent with these measurements. 4) Both experimental and predicted melting points (using Model002) can then be lined up for comparison. 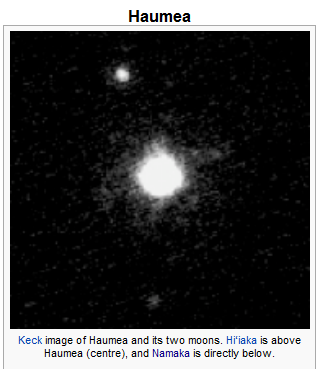 A large discrepancy between the two would flag a possible error - in this case good agreement is found. 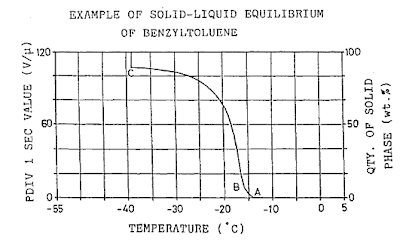 Noting that the product's melting point is near room temperature (53 C) explains why two layers were were observed to form during the course of the reaction and cooling to 0 C induced the product to precipitate. 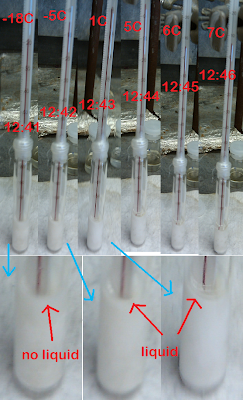 Links to the melting measurements are also provided in column N for easy exploration. 5) Column O provides a quick link to the ChemSpider entries for all compounds and column P provides links to the Reaction Attempts Explorer where, for example, one can explore other reactions where the product was involved. Finally columns Q and R provide one click access to an interactive NMR spectrum of the product, powered by ChemDoodle. 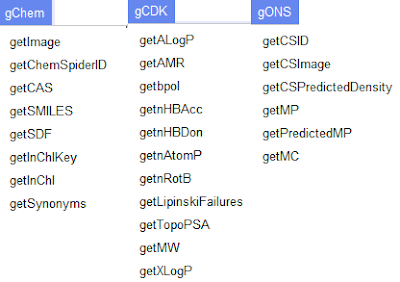 The last few columns still use our older code to call web services but over time these should be added to the gONS collection for convenience. The easiest way to experiment with this interface is probably to just make a copy (File -> Make a Copy from the Google Spreadsheet menu). 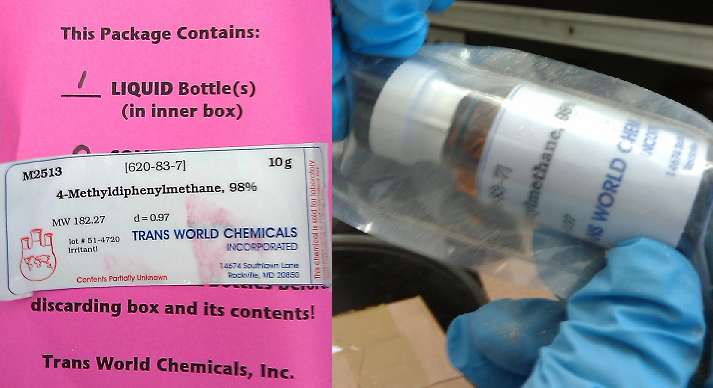 The sheet can then be customized for other applications. On June 14 and 15, 2011 I attended the Special Libraries Association conference and made presentations on two panels on the role of trust in science with a case-study of the Open Melting Point collections that Andrew Lang, Antony Williams and I have been assembling and curating. Watch Lawrence Souder's presentation screencast and slides. The second panel was on "New Forms of Scholarly Communications in the Sciences". Don Hagen from the National Technical Information Service presented on "NTIS Focus on Science and Data: Open and Sustainable Models for Science Information Discovery" and Dorothea Salo discussed the evolving role of libraries and institutional repositories on scholarly communication and archiving. Watch Don Hagen's presentation screencast and slides. 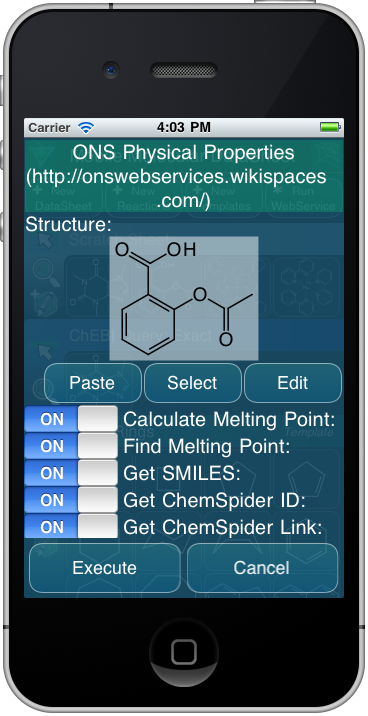 As Alex Clark explained on his blog Cheminformatics 2.0, both predicted and experimental melting points from our Open Data collection are now available on iPhones via his MMDS webservices protocol. Although the app is not free, the web service (#7 from our collection) that Andrew Lang and Alex created for this purpose is Open and available for anyone to use. 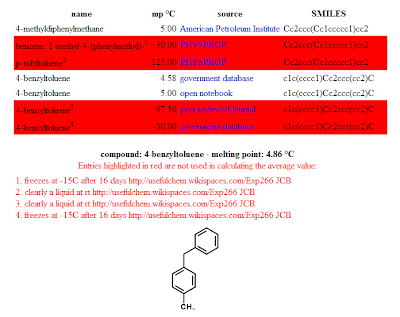 It reads an XML formatted molfile and returns the average measured melting point, predicted melting point, SMILES, CSID and a link to the ChemSpider entry.